In the 2018 football World Cup, nations that are young and hungry in footballing terms have caused some flutter. Iran ran close to Spain and Portugal. Switzerland have been doughty. Croatia has dazzled, reprising its 1998 semi-finals run. But as the group stages near completion (the last few matches were still left at the time we went to press), a broad takeaway of the 2018 group stages is this: rather than the young from Asia and Africa, it’s the young from Europe who have made advances. After Wednesday, seven of the eight groups were decided and 14 teams have moved to the Round of 16. The latest Fifa ranking of just three of these 14 was above 16: Croatia, Sweden and Russia. And even if Colombia (ranked 16) qualifies from the last group at the expense of either Japan or Senegal, this number will be the lowest since 1998 (See chart 1). 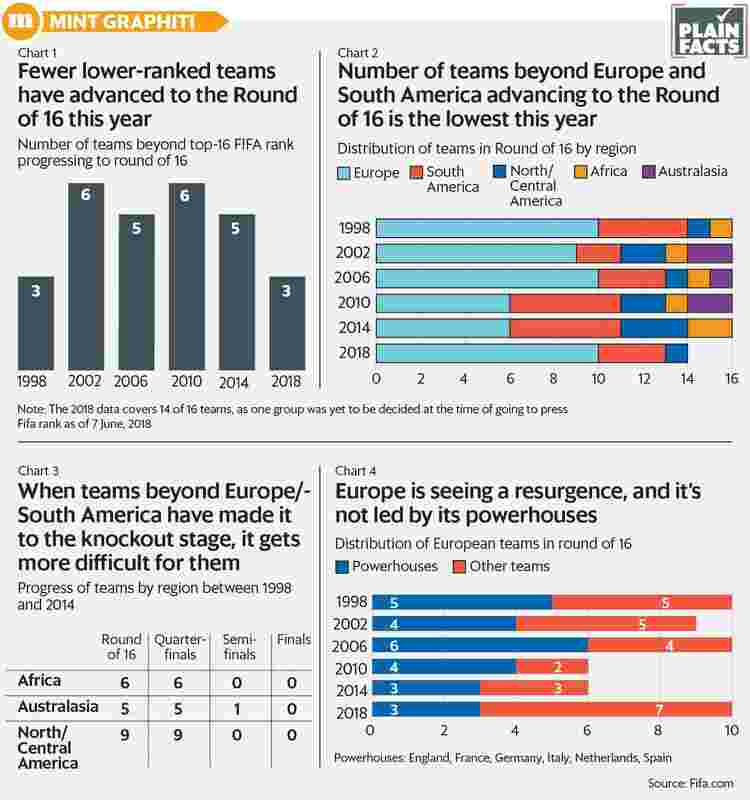 Further, the count of teams beyond Europe and South America—the two continents with rich footballing histories—advancing to the Round of 16 is shaping to be the lowest since 1998 or 2006. Of the 14 qualifiers so far, 10 are from Europe and three from South America. If Colombia qualifies too, there would be only two teams beyond these two continents. This is in stark contrast from 2010 and 2014: on both occasions, five teams beyond these two continents had featured in the Round of 16 (See chart 2). In 1998, the football World Cup had moved from a 24-team format to a 32-team format. The objective, among other things, was to capture the game’s increasing global standing and give teams—especially from Asia and Africa—more opportunities to impress on the biggest footballing stage. However, teams from Africa, Australasia and North/Central America have found it difficult to make it past the Round of 16. In the five editions between 1998 and 2014, of the 80 spots available in the Round of 16, teams from these three large footballing landscapes occupied 20 of them—a share of 25%. But as the tournament goes deeper, the presence of these continents slides. Just five teams have ever made it to the quarter finals, or an overall share of 12.5%: South Korea, Senegal and the US in 2002, Ghana in 2010, and Costa Rica in 2014. And only one team has made it to the semi-finals, or an overall share of 5%: South Korea in 2002, a World Cup they co-hosted (See chart 3). In the 2018 edition, Europe has seen a resurgence of sorts. After fielding only six teams in the Round of 16 in 2010 and 2014, it has 10 this year. This resurgence is being led not by the six traditional powerhouses with flourishing domestic leagues—in alphabetical order, England, France, Germany, Italy, the Netherlands and Spain—but by teams beyond that old order (See chart 4). Previously, Croatia reached the semi-finals in 1998, Turkey in 2002. Is there another such run, even better, in the offing? This is a tournament crying to upend the old order. But, for now, the old order is hanging on.